Question 1: Which hoya is Hoya oreogena? --- Me. Because I am totally confused. Answer: I don’t have a clue and I am beginning to believe that no one else does either. If you do, I wish you’d share your superior knowledge with me. Here is all I’ve found and the places I found it. I believe that after reviewing it that you’ll agree with me and that I am not the only one who is confused and that I am not the only one who doesn’t have Hoya oreogena in his or her collection. 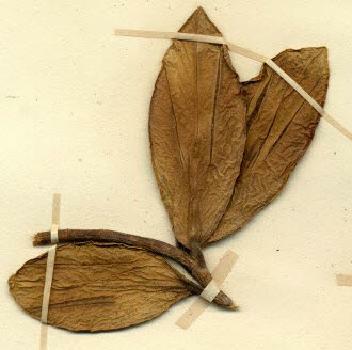 Right: A scanned leaf of IML-1513, which I got from David Liddle, labeled Hoya oreogena. It was taken from my three year old plant. All the leaves on the plant look the same except that the mature ones are larger than the juvenile ones. All the leaves are oblanceolate in shape and all have very acute, caudate leaf tips, however, I had to scan a leaf with a weight on top of my scanner lid to get the leaf to lie flat so that the caudate leaf tip could be seen. The leaf tips curve back so that every picture I took of them, either attached to the plant of separated from it appeared to have shorter, less acute tips, as in the picture below. This cannot be a Hoya oreogena leaf. This picture is of a plant collected in Northern Thailand. Photograph was taken by Dr. Piyakaset Suksatan, Queen Sirikit Botanical Garden (QSBG). I have absolutely no doubt that this is the same species as IML-1513. The acute, rather than caudate leaf tips in the picture are identical to the leaf tips in every picture I have taken of my plant. I was able to get a picture showing the caudate leaf tips only by scanning the leaves with a weight on top of the scanner to keep the tips from curving backward. This is obviously not Hoya oreogena. 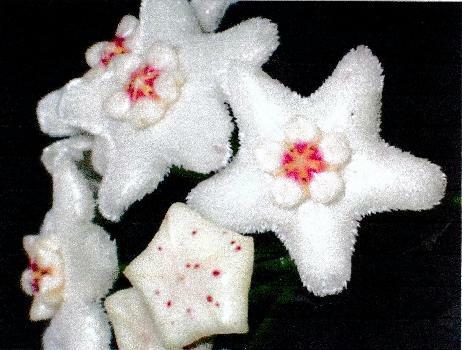 Hoya oreogena was discovered by A.F.G. Kerr at Prachuap, Kao Luang, Thailand, 5 July 1926. He published it in the Kew Bulletin (page 461) in 1939. Elliptic in shape……………………………………... Oblanceolate in shape. Leaves 5 to 7 cm long………………………………. Leaves 9 to 12 cm. long. Leaves 1.8 to 2.9 cm. wide…………………………. Leaves 3 to 3.5 cm. wide. Leaf bases cuneate or narrowly auriculate…………… Leaves narrowly cuneate – no auricles present. yellowish brown hairs…………………………. Glabrous beneath- no hairs of any colour. Petioles, thick, warty, pilose…………………………..Warty but not pilose. Petioles 5 to 8 mm. long…………………………….. About 2.5 cm. (25 mm.) long on mature leaves. Margins more or less reflexed…………………………Not at all reflexed. Corona lobes on type specimen narrowly lanceolate. & acute at outer tips………………………………….. Corona lobes obovate, broadly rounded at outer tips. 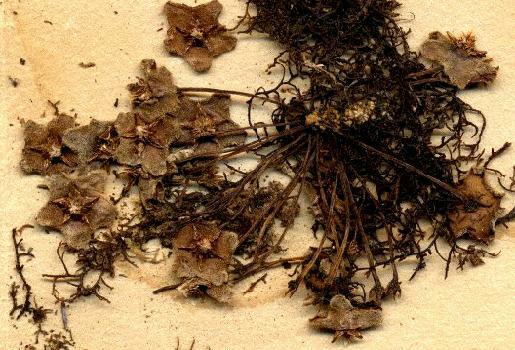 Above: A few flowers cropped (and enlarged) from Kerr’s #10857, which is the Hoya oreogena holotype specimen. Note the long, narrow, acute tipped corona lobes. Above: Flowers of Apodagis sp. #4AP-1037.courtesy of the photographer Dr. Piyakaset Suksatan of Queen Sirikit Botanical Garden (QSBG) and Sutthisak Sangkhakorn of Bangkok, Thailand. It is not known if this is the same clone as IML-1513, but I am certain that, if not, that this and IML-1513 are the same species. Neither is Hoya oreogena. NOTE: The difference in the shapes of the corona lobes. Those of Hoya oreogena are narrow and pointed at both ends, while those of this, still unidentified species are broadly rounded at the outer ends. It was very unlike David Liddle to attach a name to a hoya without ever having seen flowers but he listed IML-1513 as Hoya oreogena since 2006, however, he listed it in the last copy of his accession list sent to me as “sp. aff. oreogena” and said it was purchased at Ban Ngong Ngoy village in Thailand. As recently as a couple or so weeks before he died, when I asked if he could supply me with some flowers for study and/or a picture of a blooming umbel, he told me that it had never bloomed for him and he didn’t know what the flowers looked like. Sutthisak told me that, so far, no one he knew about in Thailand had ever succeeded in getting it to bloom either. The flowers pictured were blooming in habitat. Question 2: What hoya is Hoya filiformis? -- Me, again, because I simply cannot believe that the hoya being sold by Mr. Green and his clack could be that species. It doesn’t fit the author’s description in any way. In 1936, a fellow named Hochreutiner published a species of Tylophora and cited Hoya filiformis as a synonym, however in doing so, he added a ? and at the end of his very long, greatly detailed description he added that “it is very possible that it (Hoya filiformis) is a synonym.” For this reason, most taxonomists appear to have accepted Hochreutiner’s theory as fact and have assumed that it is a Tylophora. I admit that I have not seen Rechinger’s holotype specimen but I have seen and examined another specimen from the same location (Upolu, Samoa) that fits Rechinger’s description to a T. It is Art Whistler’s unidentified specimen #W1106. 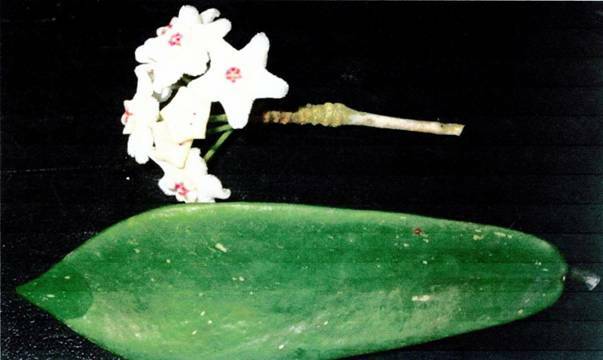 I showed a Photostat copy of this one to Kloppenburg when he visited me in 1984 and he immediately concluded and expressed the opinion that the tiny flowers on that specimen were not flowers but buds. I had already seen the flowers under the lens of a microscope and they looked like mature flowers to me but when I was in DC in the late 1990s, I was given permission to remove several of the flowers from that specimen to make photomicrographs. What my photomicrographs showed was that the flowers were fully developed hoya flowers, just as I had thought when I first saw them. The pollinaria are the very last parts of the flowers to form. All three of the flowers I photographed had fully mature pollinaria. The pollinia are long in ratio to width, not wide and semi-circular, as Hochreutiner described the pollina of his Tylophora filiformis. I have absolutely no qualms about declaring that Art Whistler’s W1106 is Hoya filiformis Rechinger. I just wonder why Whistler did not recognize it as that when he made the specimen. He did not put a name on the specimen. My examination of the flowers shows extremely long anther appendages, sort of like those of Hoya caudata and Hoya imbricata except that they are broader in ratio to length. I can find only one difference between Rechinger’s description and this plant. Rechinger said of Hoya filiformis, “The entire plant is completely bald.” The Whistler specimen is completely bald except for very widely spaced cilia on the flower’s sepals and a few hairs circling the base of the corona. I’d like to suggest that Mr. Green’s “Hoya filiformis” might be Hoya attenuata. Hoya attenuata foliage looks almost identical to Hoya filiformis foliage. NOTE: I said “might be,” not “is.” It’s flowers are almost identical to those of Hoya chlorantha except that they are smaller and of a different colour. Mr. Green’s plant, most definitely, is NOT Hoya filiformis. Art Whistler’s W1106, in my opinion, most definitely, IS. 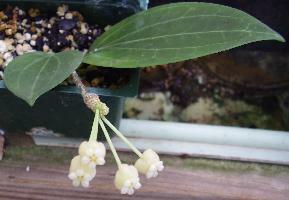 The flowers on this plant are the smallest of any hoya species I have seen. In case you are a novice and unaware of the history of Hoya reticulata, Schlechter’s publication of the name was at least the third. It is generally thought that the first publication of the name Hoya reticulata is a synonym for Hoya multiflora but even when such a situation is proven, the name cannot be recycled and used for another species, so P. T. Li, noting that Schlechter’s name was a duplicate of a previously published name, renamed it for one of his associates. The new name for Hoya reticulata Schltr. became Hoya chuniana P. T. Li. I did not agree with David’s diagnosis of Hoya chuniana. I don’t know if my questioning it had anything to do with his changing his mind or not. I do know (after tracing this IML# in his catalogs that he sold it as Hoya chuniana until 2006. Leaves cuneate-lanceolate or oblong. Leaves cordate-ovate. Leaves 9-15 cm. long, no width noted. * Leaves @ 8 to 10 cm. long X @ 5-7 cm wide. Leaf apex and base acute. Leaf apex acute but base is cordate-rounded. almost entirely inconspicuous. extremely conspicuous. Corolla 4 mm. diameter. * * Corolla @ 10-12 mm. diameter. * Without a width measurement, this species will be hard to identify. Warburg’s types were destroyed in WW-2 bombing. * * I suspect that the corolla measurement given by Warburg is inaccurate due to his measuring a flower in its reflexed stage instead of flattening it or waiting for it to start closing, as I and most others do. Note: I said “suspect,” not that he actually did. For those who may have gotten the same species even earlier, Hoya hellwigiana Warb. was “sunk” into synonymy with Hoya pottsii Traill by Forster and Liddle in 1992, in the publication, Austrobaileya 3(4): 635. I can’t afford to subscribe to all these publications so I’m not 100% sure, but I don’t believe that there has been any formal publication separating them again. So, you see, it is very important that you keep all labels with all names and numbers that came with your hoyas. It can save you a lot of money by warning you when you are about to buy something you already have with a different name on it. It could also make it easier to replace a favorite that you lost by telling you what it is now called. Trading cuttings with fellow hoya enthusiasts is a good and cheap way to enlarge one’s collections but sometimes it doesn’t pay. I really got the short end of the stick in a trade I made recently. I was looking for a particular clone of Hoya australis subsp. australis that I grew for many years but lost in that infamous Christmas Eve freeze in 1983. So, when one of my Robin members* suggested a trade and sent me a list of what she had, I saw she had IML-8 on her list and knowing David Liddle had that listed as Hoya australis subsp. australis I said, “Okay, I’ll trade you a Hoya hypolasia for it. I ignored my long standing rule which says, “The person who first suggests that we trade should be the one who sends first.” That way if that person sends something else you can send it back and the “deal is off.” I went ahead and sent a small rooted cutting of Hoya hypolasia. What I got in return was another one of those blasted trinerved leaf Hoya pottsii look-alikes that are a penny a hundred! The lady I traded with said she “knew” it was Hoya australis because it has white flowers! This was a lady who belonged to HSI for all the years it existed – and she didn’t know that all white flowers aren’t Hoya australis. * Yes, there are still a few people who don’t have computers who keep in touch via USPS mail. #1: People who jump at unfounded conclusions. Several years ago a well known California writer on Hoya subjects told me that he did not need to read full sentences to know what the sentences said. He said reading entire sentences was too time consuming. He didn’t say it but several times during that same conversation, he interrupted me after I had only gotten two words out of my mouth (I hadn’t even gotten to the verb in my sentence yet). He said, “I know what you are going to say and the answer is ---- etc. Well, he hadn’t known what I was going to say and his answer was completely unrelated to it. I think that he isn’t the only one who doesn’t know “doodly squat” about hoyas due to that bad habit. I have been accused of talking down at people and of calling them stupid. I haven’t called any specific person stupid (except that California writer on Hoya subjects – I say, “He is stupid.”). * but today I’m going on record. What can I say that will prove them wrong when people really do appear to me to be stupid? Like, today, for example. I got two e-mails sent to me via eBay. EBay, of course, has a rule that forbids sellers from making deals with potential customers to buy the plants offered on eBay, outside of eBay. They ask us to report anyone trying to make that sort of deal with us. The writer of the two e-mails I got lives in a European county. I said in my ad that I would not ship to foreign countries. I say that because I do not have time to drive 40 miles to Hartsfield-Jackson Airport, deal with Homeland Security, then sit for hours waiting for a customs inspector to come back from whatever assignment he was called out on so he can inspect my plants and give me a phytosanitary certificate. Last time I did that I was left sitting for 5 hours and then told to come back tomorrow. I missed two meals; got terrible cramps in my arthritic knees and ended up having to drive home in rush hour traffic --- two days in a row! No way will I do that again. The eBay writer wanted me to sell her the plants privately. I answered her first letter by asking her, “What part of I don’t ship to foreign countries don’t you understand?” I answered her second letter by telling her, “Sure, I’ll sell you that species but you’ll have to come and get it!” I hope she knows that if I report to eBay the contents of her letters to me that eBay would ban her from eBay – at least that is what I was told would happen. I go on record --- That lady is stupid! I can write, “The sky is blue,” and someone will write me an e-mail and ask, “What colour did you say the sky is? Accession List: A list of things that have been acquired; acquisitions. Ascension List: A list of things that have arisen. Christians think that Jesus “ascended.” Until we learned better, people thought the sun ascended every day. I arose this morning, as I do every morning but I’m not on any ascension list that I know about. Arthritic people like me have a lot of pain when ascending anything. I suppose one could say that the climbing hoyas ascend to the tops of trees in habitat but they seldom do in cultivation because most of us train them to wind around and around instead of leaving them free to climb. I know of no authentic “ascension list,” but if there is a heaven and, if it is UP, I hope I’ll be on the list to ascend there. Meantime, it would be nice to see those who keep saying that this and that hoya is on David Liddle’s “ascension list.” He didn’t have one. He did have an Accession List. The last copy sent stopped at IML-1581. Get with it, dealers. Stop flaunting your ignorance. NOT ONE OF YOU has a Hoya ascension list.